An air-conditioned play area featuring a bone-shaped pool, pool deck, pint-sized lounge chairs, and plenty of room to run around! Poconuts is the place "where little dogs go nuts!" This amazing indoor area ensures that your pet can play and exercise everyday regardless of the weather! Poconuts Beach Club™ is staffed and supervised at all times. 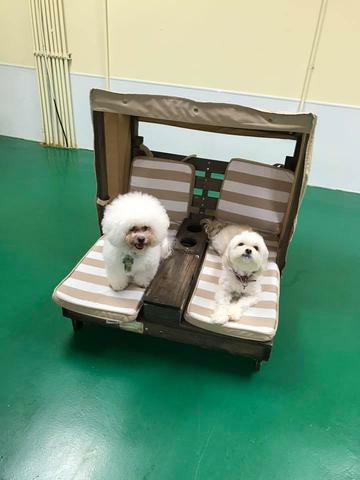 Doggie Day Care includes all day play and a private suite for rest time and feeding if needed! Reservations are required in advance as we do fill up! **All dogs must be spayed/neutered and friendly in order to participate in group play activities.